We’ll maintain your beautiful landscape all year long. It’s what we do every day… design, build and maintain our client’s landscapes. We have a team of 50 employees and a ton of resources at our disposal. It’s not that we’re bragging but it does set us apart from other landscape design companies in Westchester. 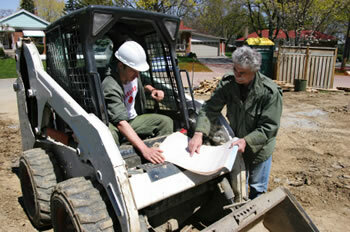 After we design your landscape, you won’t have to act as a general contractor, hiring a dozen different companies. That’s because we really can do most of the work… lawn installation, tree removal, outdoor lighting, irrigation & sprinklers, even some things you wouldn’t expect, like our Arborscape Advantage Services. If you don’t have a landscape architect or landscape designer we can help. We have lots of experience with simple & complicated landscape design and installation. And… when the work is done, you can count on us for your landscape maintenance. Some design projects will be created during a client meeting. But sometimes your project may be much more elaborate. Complicated projects will involve the creation of a site plan, either by hand drawing or our computer aided design program. We’ll also assist in obtaining permits and permission to execute your project. Site plans will show all necessary details of the project, including construction details, site details, hardscape details, plant layouts, lighting design and irrigation layout. Our landscape designers are entrenched in the design world but their designs are based on real world landscaping experience. As a full scale landscaping company, we have the day to day experience in the field that gives us a unique perspective. Not all landscape designers get their hands dirty. Having the ability to design and build, puts us in a unique position to give a greater value to you. With over 50 employees and all the heavy equipment needed, we can deliver a lot more for less, by not subcontracting a lot of work. 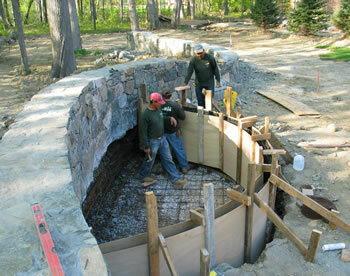 We do much of the landscape installation ourselves, or work with our select pool of preferred contractors. We’ll be your general contractor and project manager… so you don’t have to be. We don’t want to exclude ourselves from working with other landscape designers or architects. We work well with others and can appreciate the importance of respecting another designer’s interpretation. We’re happy to make another designer’s vision come to life. We have many landsape design clients in Chappqua NY, Bedford NY and Armonk NY. But we do service much of Westchester as well.